Hello My Device seems to have quit working. Can I send it to you for evaluation? Thank you very much for fixing my device. I was able to get it today. It appears that the replaced part(s) makes it necessary to reconfigure the device to recognize the WiFi system. Yes, the first thing our RMA department will do is reflash network settings so that they can connect to the board. You will need to reconfigure your network on the device. Can you tell me if the device I sent for your examination actually needed repairing? I have reconfigured it and am still having some sort of difficulty connecting to it. On the Roving Networks WiFi module the D1 LED is slow flashing green. On the board itself the Ready LED is solid red. My android phone app is set to see this thru my WiFi but indicates “Device not Available Local or Remote”. Any suggestions? Something changed because this used to work flawlessly, but suddenly stopped. It looks like no issue was found after 48 hours of testing and automation. Can you send me a screen capture of the settings being put into the module (minus the network passphrase)? Thanks for your response. I think this is the screen shot you need. So some odd things I’m seeing that would effect the application if not properly configured on software and/or the relay controller. The Baudrate is set to 57600 whereas the boards are configured by default with 115200. So if the board hasn’t been set up to use 57600 then that will be an issue. Have you configured the board to use 57600? Can you double check the router’s IP address? Hello Jacob - I was able to change the baud rate to 115200. Then gave it a few tries with the settings in my latest screen shot. 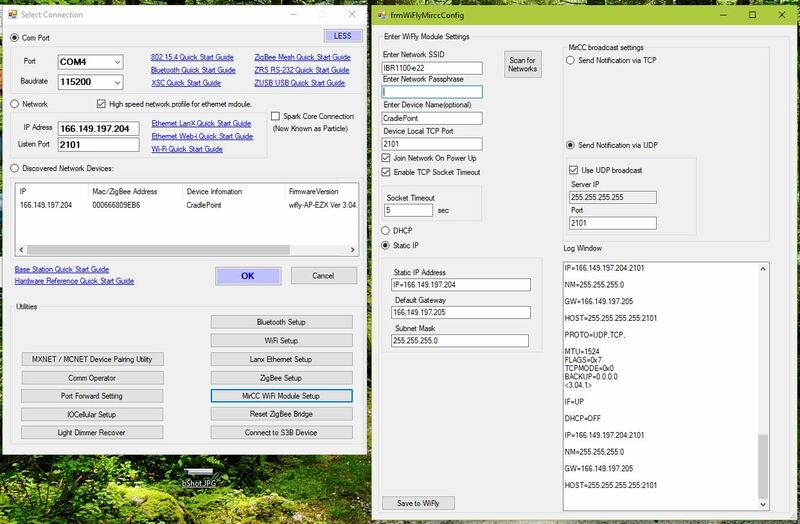 I have included a shot of my settings page to confirm my Static IP Address. I’m still having some sort of difficulty. I’m open for any suggestions. Can you help? 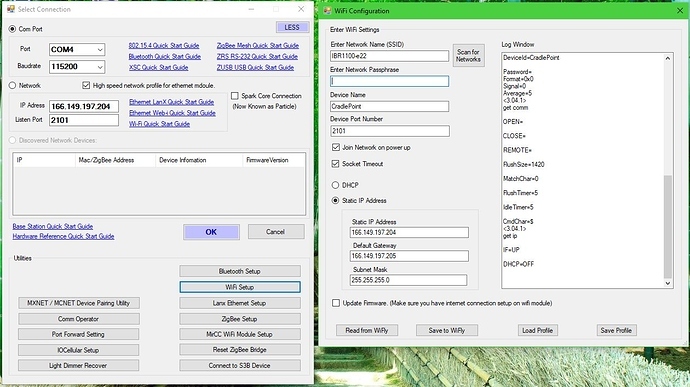 Do you have a router available you can test the device in DHCP mode with? 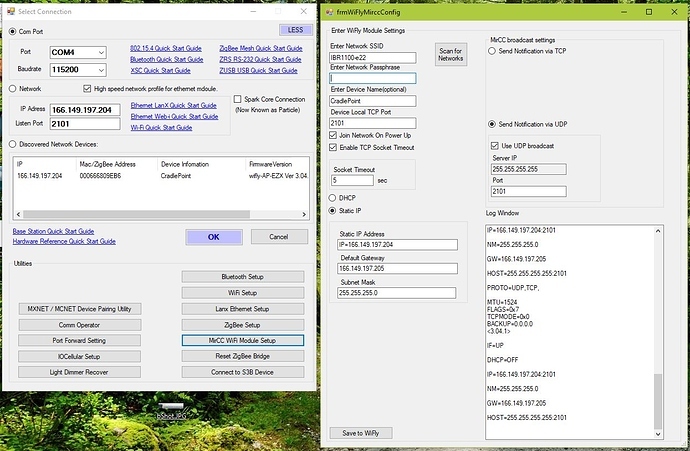 Also can you send a screenshot of the windows under the MirCC WiFi Module Setup window? Hello Thanks for your help. No I don’t have any other modem to try this with. I have a question - You mentioned earlier the IP address for the modem I am trying to connect thru. My question is - does my CradlePoint have a separate IP address other than the Static IP address I had assigned to it? In other words are there two IP address, one for the device and another assigned as a Static IP? Another issue, over on the right you will see that MirCC broadcast settings. Right now when it has data it is trying to open a socket to IP 0.0.0.0 on port 2000. 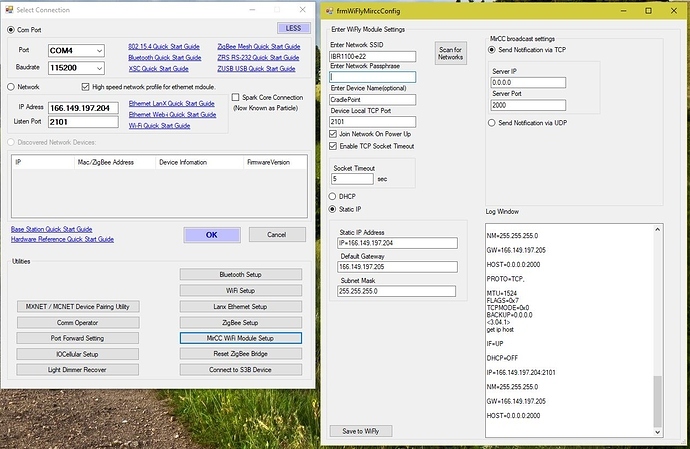 Don’t know how this was changed, but if you’re expecting a TCP socket then you’ll need to change that Server IP to the IP address of the receiver and the expected port. If you’re expecting a UDP you’ll want to change to Send Notification via UDP. I’m not sure which is expected a TCP socket or UDP. Can you tell me how to figure out which I should set up? Are these settings I can change using your WiFiMirCCConfig App or do I need to get with my Router Admin help to adjust those settings? Well it depends on what software you’re using to get the messages. Was it one that had been created by your firm or is it a third party software like N-Button? Is there a way to configure what the software is monitoring and if so can you send a screencap? It should say the word Port somewhere. In a nutshell a UDP datagram can, and in the case of most of our boards does, usually generate a packet that goes to every device on the network. For instance the WiFi module has a default UDP broadcast that allows base station to find it. It can also be targeted to a particular IP address on a particular port. This could be compared to one device sending a piece of mail to one or multiple other devices. A TCP socket is more like a phone call. One device will initiate a tunnel to another device based on the IP Address and Port number and data can come and go freely. Thank you for your help. This is way over my head, but I was able to previously get this working very well, so I want to keep trying. I was able to use your NCD Base software and MirCC WiFi Module Setup to change the settings shown in the latest attached Screen Shot. Are others having similar problems? Not having this issue anywhere else. Can you try opening a UDP listener on your computer and altering the inputs to see if you get a packet on port 2101? You can do this in Comm Operator in Base Station or you can try another Socket listening utility if you’re more comfortable with a different one. Also do you know what port your software is listening on? My thought here is that the broadcast is going out, but your software is expecting the data on a different port. Thanks for your response, sorry to take so long to reply. I do not have other socket listening software. 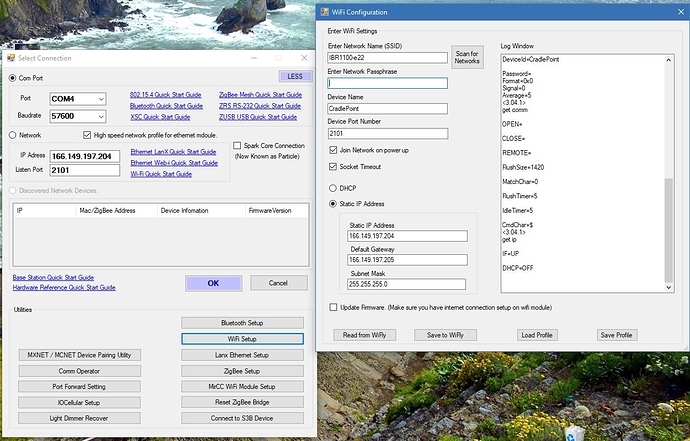 I have included a snip from my Cradlepoint Net Cloud Manager. The Net Cloud engineers have assured me that no changes have taken place that would cause the device to no longer connect.They walked me thru the settings to make sure this devise should be able to be seen with your phone app. We tried to ping the NDC card but it is not detectable. I have included a snip of some of the Cradlepoint settings. I am not sure which software you are referring to here. Can you help me determine why the device has stopped working or no longer connecting?